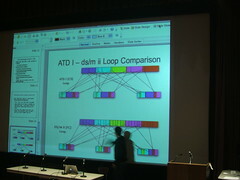 Sciencey: Chris Kiefer's neural network classes were interesting; he described a continuous-time recurrent neural network, which is a type of neural network that can respond to a sequence of inputs with a sequence of outputs, and showed how it can be used to evolve interesting synth parameters. The Gamelan research done at Graz was also fascinating. 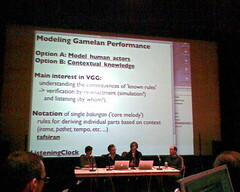 They clearly did a lot of work, including musicological and DSP analysis but also cultural considerations: for example, in the West we may be predisposed to search for a "fundamental" in a musical note, but Gamelan tunings are pretty different and it's not clear if Indonesian ears hear it the same way - all of which means it's tricky to build a good model for the instrumental sounds which captures what it should. Anyway they showed a generative Gamelan system which certainly sounded lovely to me, although I'm in no position to judge its accuracy. Installationy: Dan St Clair's installation was fantastic, little speakers programmed to play birdsong versions of catchy songs. He puts them in a tree and lets them blend into the environment, and then there's a strange moment when you're walking along and you hear birdsong, but then you realise it's singing "Like A Virgin". He used a harmonic analysis technique to morph actual birdsong recordings into the intended melodies. I also liked Renate Wieser's installation, which was an auditory game based on platonic ideas about the yearning for truth! Using a gamepad you do a kind of balancing act and try to lift off and ascend up a scale that passes through stages such as "economist" and "radical". Musicky: Lots of good stuff. I'll mention Sam Pluta's video piece which was composed of short fragments of well-known films, arranged so that all the sonic-best-bits came together to produce the musical work. The timbral sequences formed from movie "silences" (not really silent) were the best bits. It was impressive enough before I looked down and noticed that Sam was controlling it live in real-time, using a nice live looping-but-not-looping technique which he described in a later talk. Others have said this: the diversity was striking, not just from music to science to art, but also the diversity of musical styles and of programming styles. It seems that SuperCollider not just allows but encourages a wide variety of approaches. This can make it tricky to teach or learn SuperCollider, but ends up with a nice range of results.